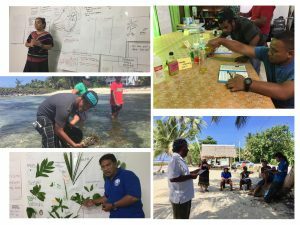 On May 1–5, 2017, Kosrae Science teachers and PREL staff held a week of PCEP workshop sessions to gain deeper understanding of place-based education. Teachers see the benefits to align PCEP resources with Kosrae Department of Education (KDOE) Science curriculum and to model ways of using places, stories, and PCEP materials and resources to support student learning on climate change, impacts, and adaptation efforts. Throughout the workshop, additional PCEP resources were introduced such as the Water for Life Handbook, PCEP Coral Reef book, PCEP Agroforest book, and PCEP Climate Change Impacts & Adaptations interactive, Place-Based Education in Elements of Design, and the PCEP High Island Poster. PCEP resources provide student-friendly information that supports the learning of the children. One major highlight of the workshop was taking the teachers out on a field trip to Tafunsak Sandy Beach. On the field trip, PREL staff held a scavenger hunt of different types of microorganisms followed by various different teaching strategies using PCEP books. After the workshop, teachers were eager to develop lesson plans aligning PCEP resources for students to explore a wider issue of climate change impacts and adaptation practices. This workshop was a major achievement in the Kosrae PCEP development agenda and highlighted the interconnections of place-based education, sustainable development and resilient practices that can be extended to the schools and our communities. PREL staff co-presented with teachers to parents and teachers in the other elementary schools on place-based education and PCEP materials.